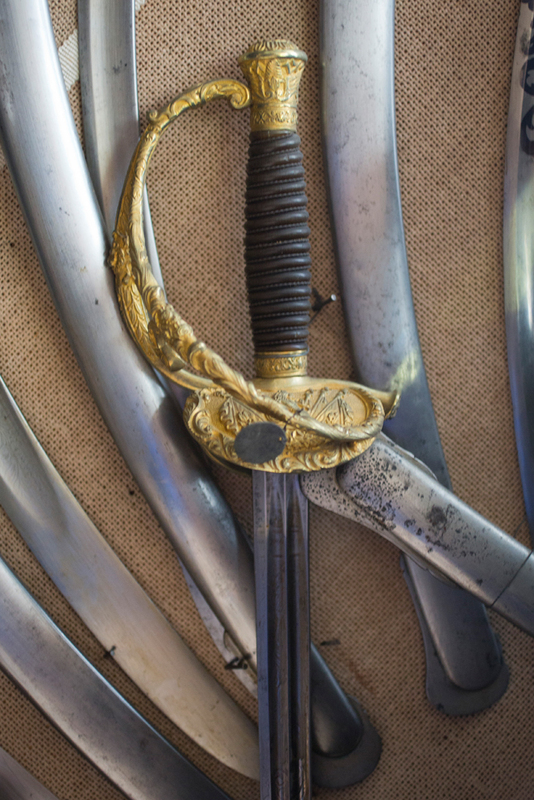 If you have found your way here, you are clearly interested in Belgian smallswords and I can but urge you to buy my book 'Belgian Smallswords, Status Symbols of Times Past', which has been written since I created this site and contains a lot more information than you will find on this page. For more information on the first ever book on Belgian smallswords, see here. The royal regent's decree of July 1st 1831 allowed Belgian officers to keep the sword they owned at the time. This was the Dutch 1820 pattern sword. 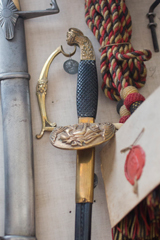 It features a straight, flat, single-edged blade with a single fuller. 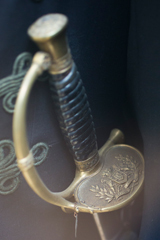 The blade is engraved, blued and gilt. 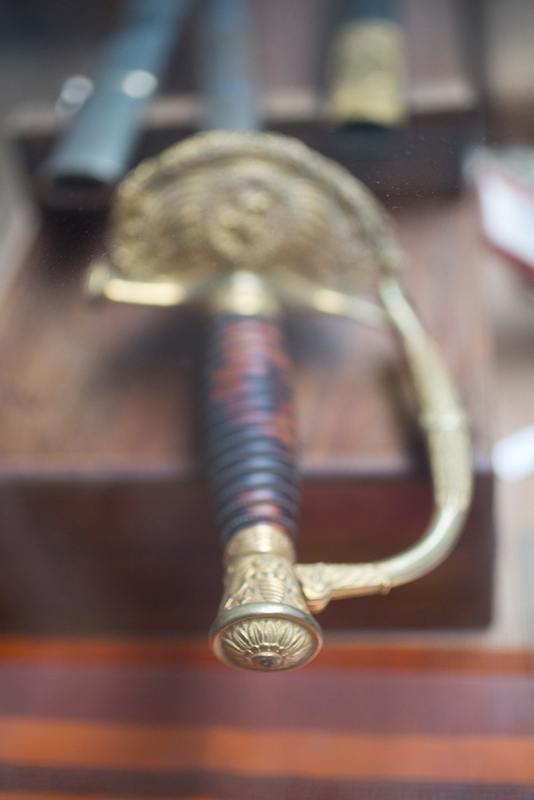 The tip of the blade is shaped as a carp's tongue. Single bar guard, in gilt copper prolongated into a straight quillon. The hilt features two shells, one of which can be locked in upright or lowered position via a spring button. 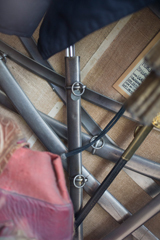 The grip is made of wood, with spirals, covered with a reeded silver plate. The pommel is a dodecagon with a rounded protuberance on top. Blackened leather scabbard, locket with frog stud and copper chape with a small symmetrical shoe. 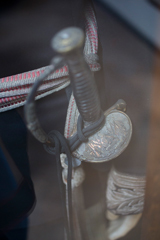 Mounted troops were provided with the same sword, but sporting a metal scabbard with two bands with loose rings . It seems that this sword was still used for custom officers after it was replaced in all other outfits in 1845. For those of you wondering about how a sheet of metal is wrapped around the grip, here are two interesting pictures. 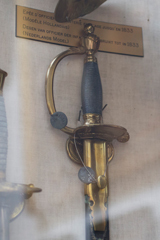 The senior officer's sword was not described for a long time after independence (in fact, Leconte tells us that this model was not yet described in 1846, though it had been replaced the year before). There is, however, some indirect information on this model. 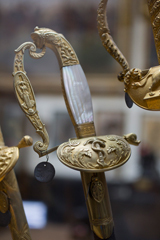 This can be found in the royal decree of July 8th 1831 describes the Quartermaster's (Intendant) sword as being that of the staff and "having a gilt shell and a flat mother of pearl grip with thick grooves." 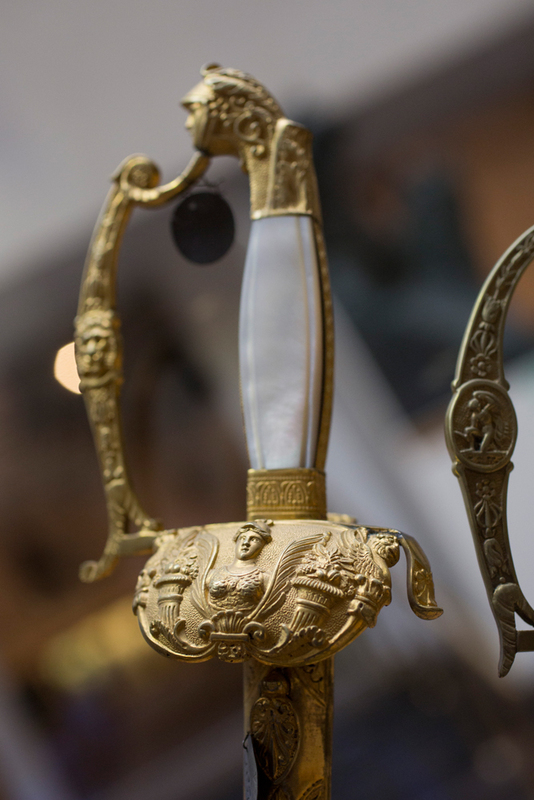 Leconte mentions seeing sword that corresponded to this description, being similar in design to the bandsman's sword and showing a series of shell designs, specifically : a trophy of arms including a helmet, a bust of Minerve with cornucopia or the serpent and mirror of prudence. 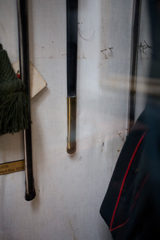 He attributes these swords respectively to staff, quartermasters and surgeons. The royal decree of April 17th 1837 states that Engineer officers will wear a sword with a grip made of alternating black horn and copper wire. Until 1837, Marine officers, surgeons and accountants carried a sword, which was then replaced by both the 1837 Marine Officer's Saber and a fantasy sword they were allowed to wear to balls when off-duty. 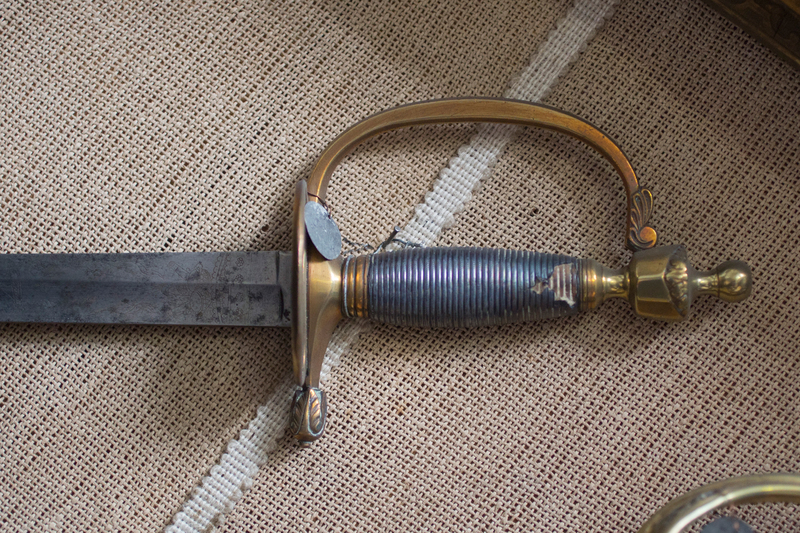 Straight fullered blade, 70 cm long. 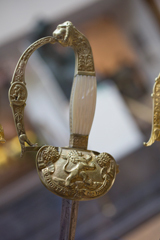 Single branch guard 'à l'allemande', with a lion's head at middle height. 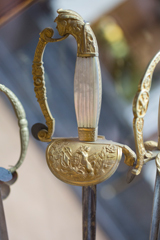 The branch is prolongated into a curbed quillon supports two languets, decorated with fouled anchors. 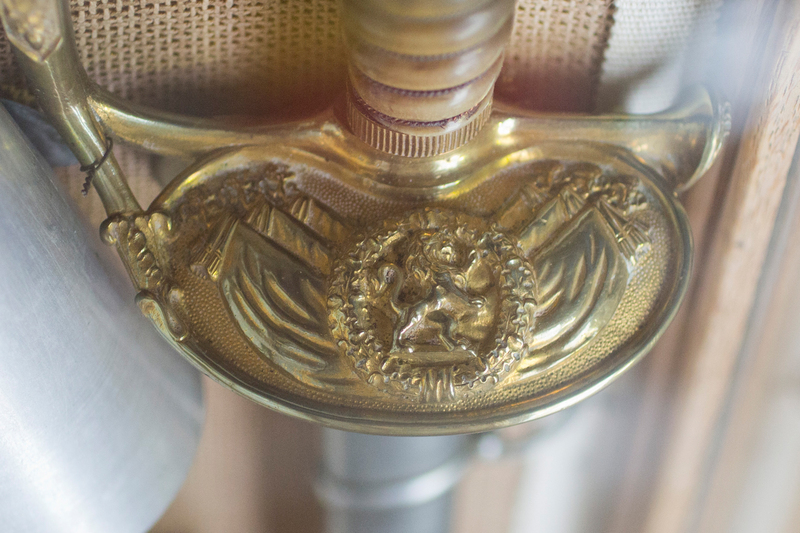 Lion head pommel, extending along the back of the grip. 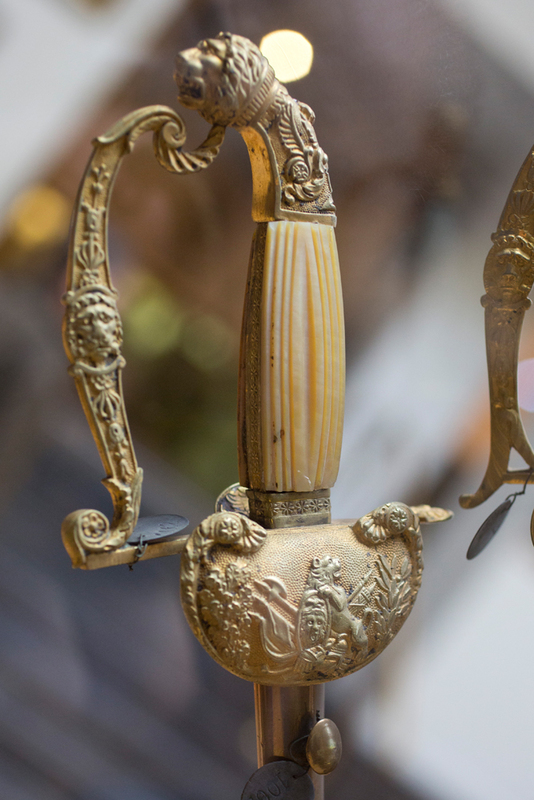 All these parts are in gilt copper. 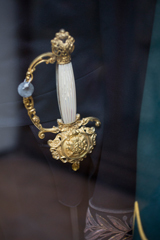 Ivory grip with big spirals. Blackened leather scabbard, locket and band, both with loose rings. Chape with shoe in gilt copper. 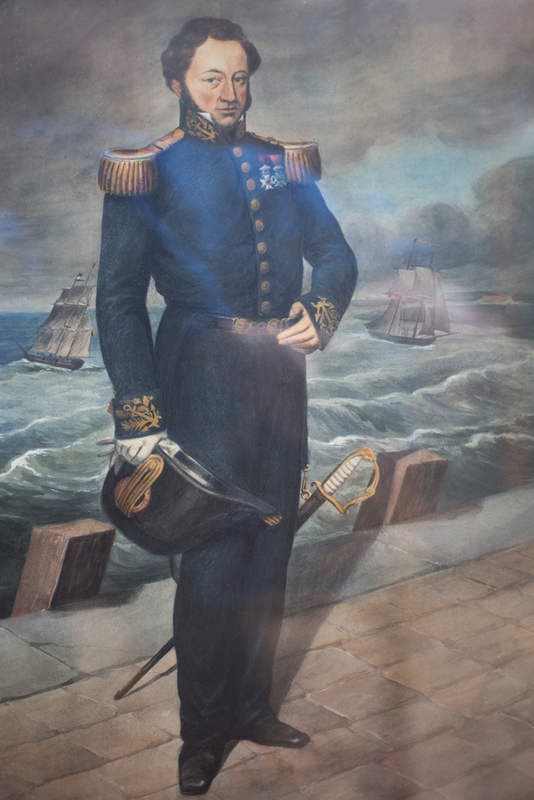 I could not find any examples of this sword, but only a portrait of an Navy officer wearing a similar sword, and the hilt of a sword that might correspond to that shown in the portrait. 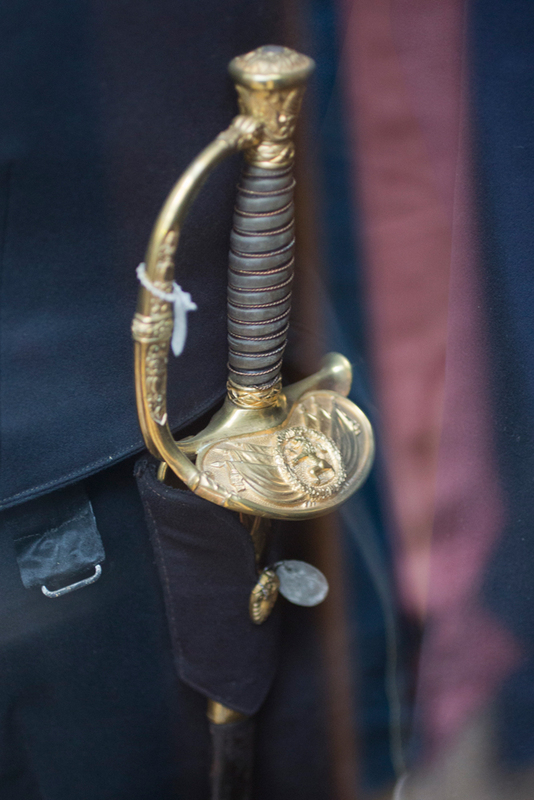 Accountants of the Royal Marine wore such a sword, but with white metal fittings. 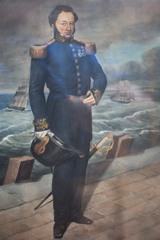 This version was attributed to marine commissaries as of December 13th 1838, until December 31st 1891, when it was replaced by a sword of the second general model. 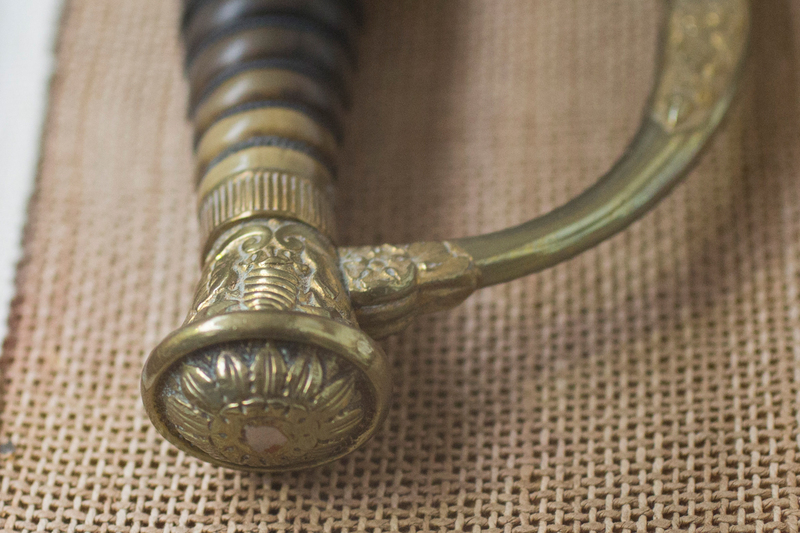 On November 6th 1843, marine engineers were attributed the sword then in use in the army, with sword knot. 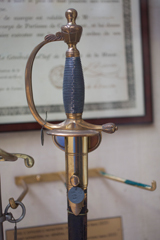 A document of June 18th 1836 prescribes the use by mounted infantry officers of Cuirassier swords (not sabers), with a polished steel scabbard. This scabbard is fitted with two bands with loose rings and has a symmetrical shoe. 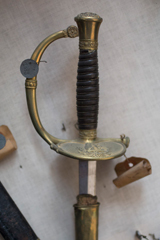 This sword was to be worn on a black leather belt whith yellow buckle when mounted and on a baldric (and in a leather scabbard) when on foot. This sword is clearly a copy of the French 1816 model, prescribed in France as of September 23rd 1815. It features a straight double-edged blade of diamond section and measuring 82 cm in length. 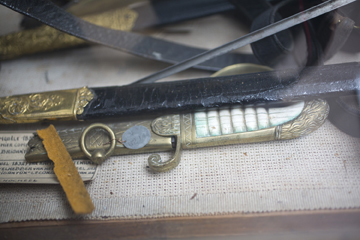 The tip of the blade is shaped as a carp's tongue. 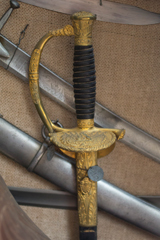 The hilt and pommel are chiseled and gilt. 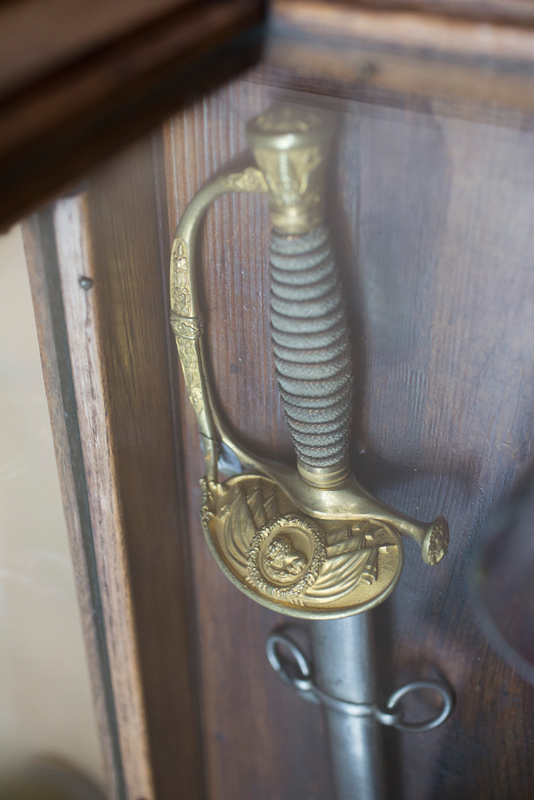 The sword boasts two shells, one of which is featureless and can be locked in upright or lowered position via a spring button. 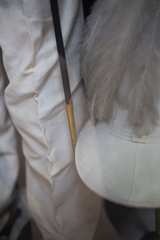 The grip is made of black horn or ebony with spiral grooves holding a gilt silver wire. For senior officers, the fixed shell shows six flags, with lions atop the flagpoles and, in the middle of the design and overlapping the flags, a lion within a garland of oak leaves. 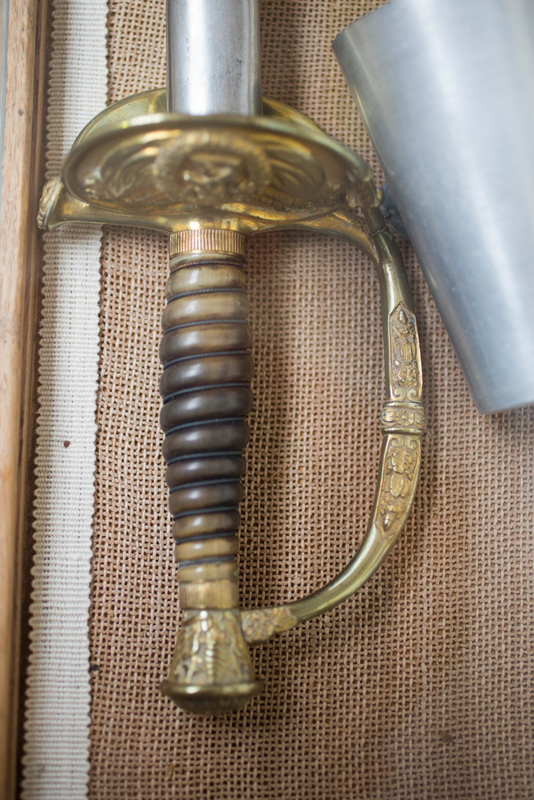 The shell's background is grainy and the pommel is engraved with thunderbolts. 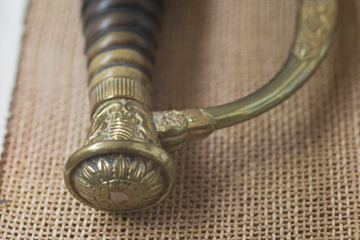 A chiselled ring is apparent a the guard's mid-height. 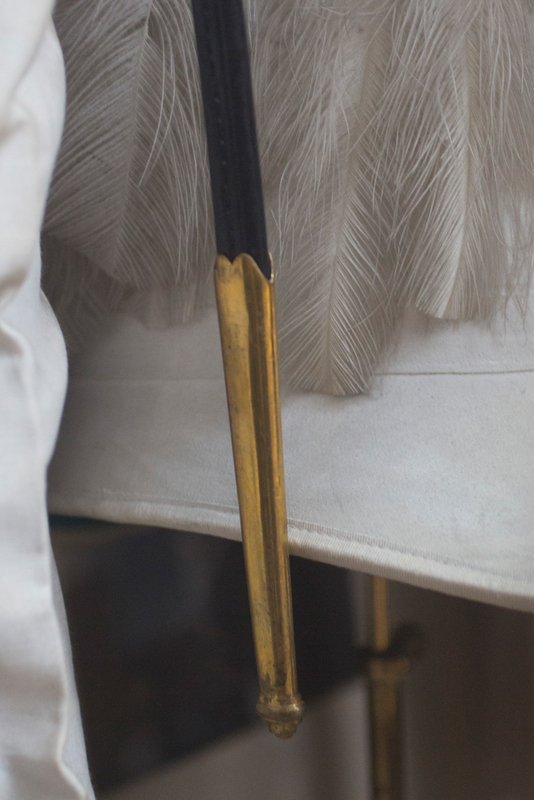 The guard itself shows some chiselling and the quillion terminates in a lion's head. The scabbard is made of black leather with gilt chape and locket. The chape is fitted with a chiseled frog stud in the form of a shield. The locket measures 9 cm, the chape 15 cm. 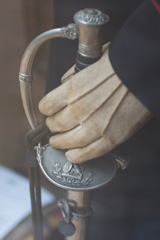 For non senior officers, the flags are absent from the shell, the chisellinng is absent from the pommel and the guard (which sometimes has no ring at all). 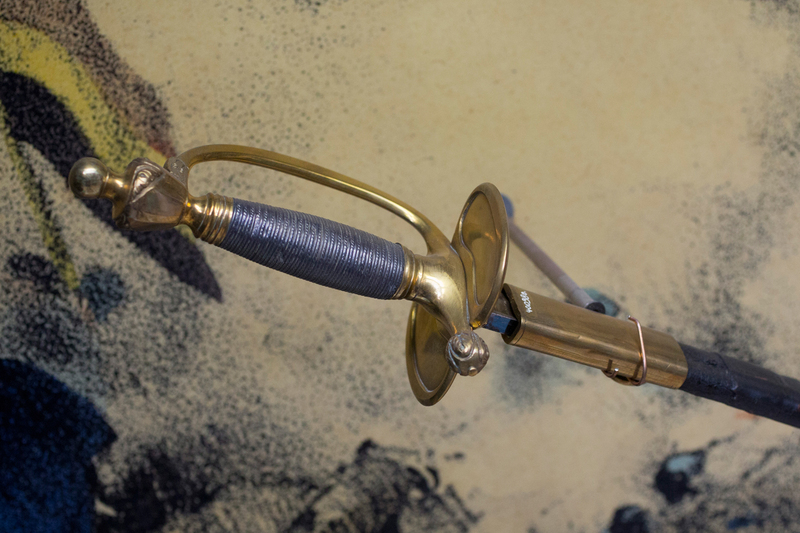 The scabbard's chape and tang are gilt and browned, without chiselling. 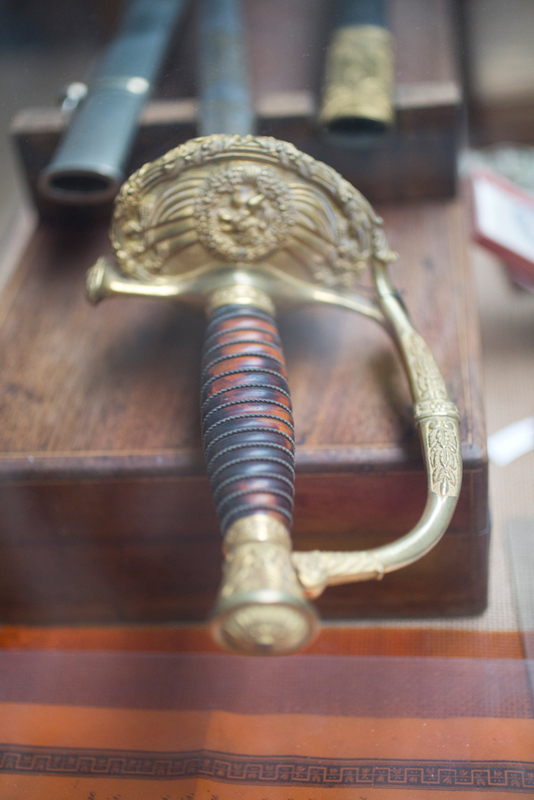 Military school pupils wore a sword of this type. 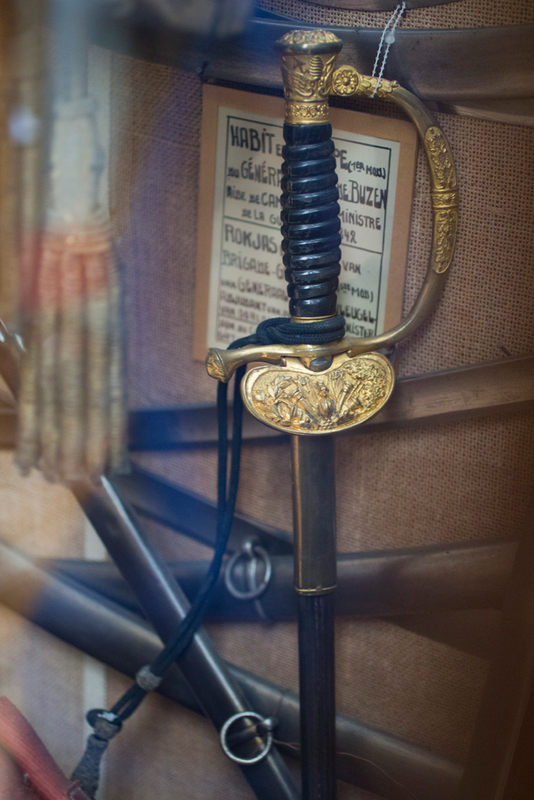 When riding, all officers used a steel scabbard. 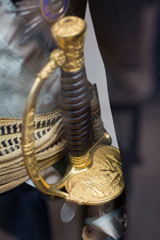 Examples of this sword pattern can be found here, here and here. 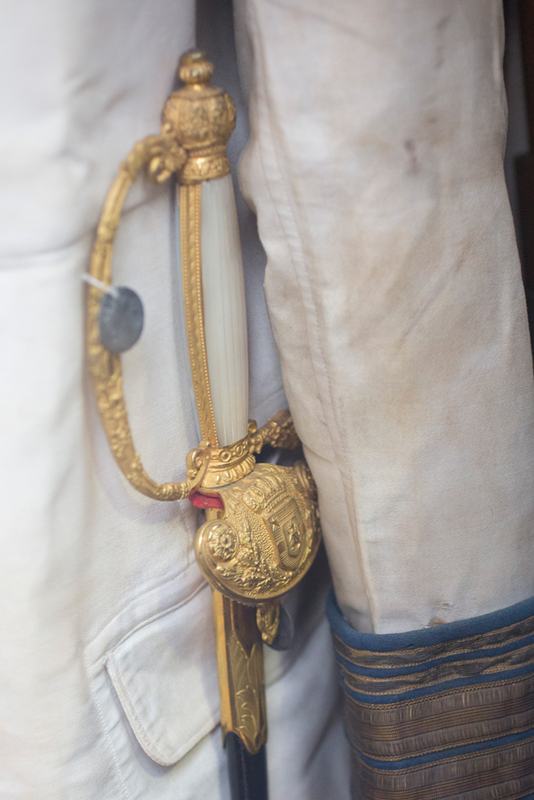 A ministry decision of August 14th 1840 gave the right to wear the non-senior officer's version of this sword to all de ligne infantry officers, but with the leather scabbard only. It is therefore sometimes refered to as the First General Model. The royal decree of January 31st 1845 introduced the Second General model sword type. This is a slight modification of the First General model. The fixed shell is decorated with the same six flags, but the wreath is gone and the lion now leans on a buckler showing the king's sigil (L for Leopold I & II (& III ? ), A for Albert I). 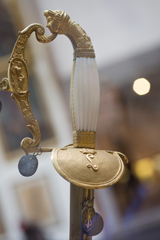 The buckler is placed on a pedestal which also supports a branch of oak and one of laurel. 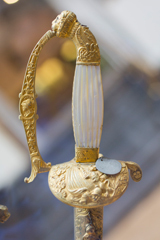 The hilt, chape and locket are gilt and chiseled, while the grip is of horn, with a gilt silver filigree spiral. 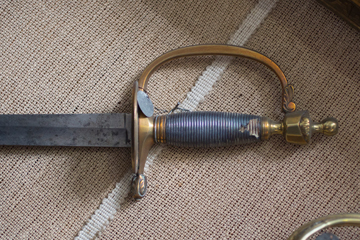 The scabbard chape is now 11 to 12 cm long. 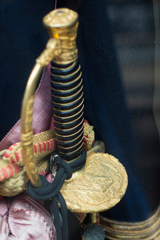 For non senior officers, the flags are absent from the shell and the chape and tang are gilt, without chiseling. Mounted officers and those of the veterinary & medical corps use a metal scabbard. 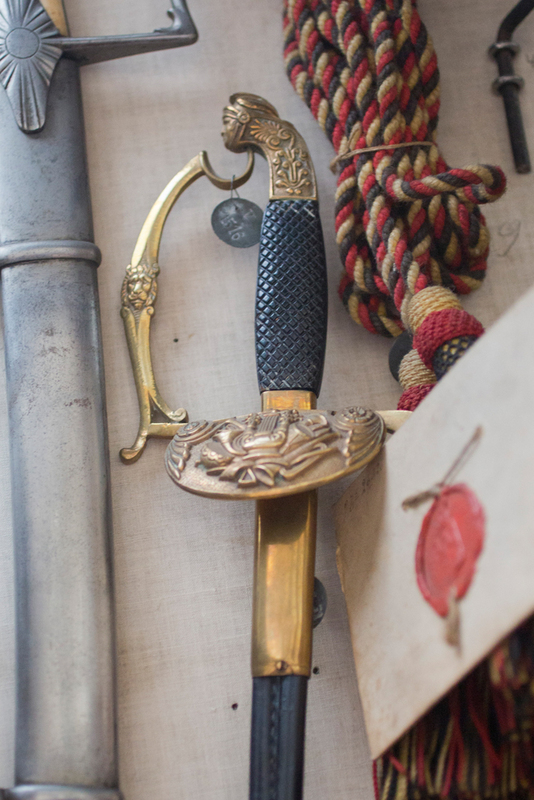 Examples of this sword pattern can be found here, here, here, here, here, here, here and here, this last example being a variation of the Senior officer's model. Variations : Senior officer fantasy swords. 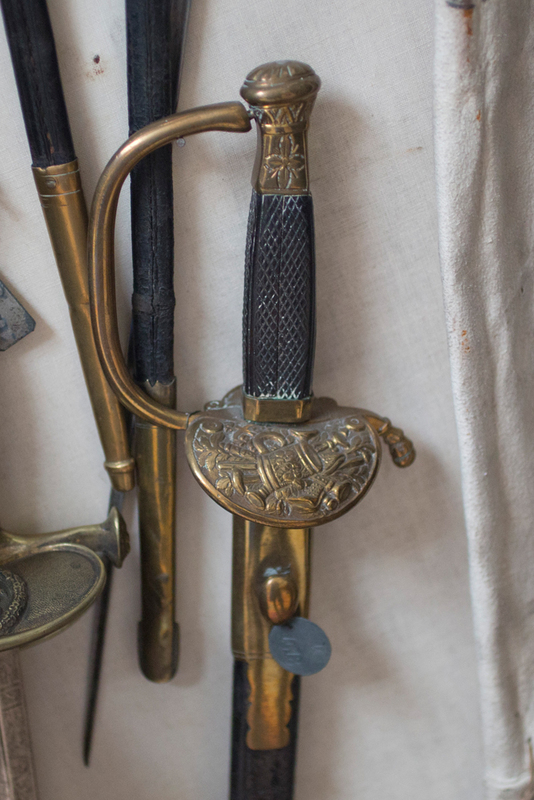 Variations : Silver metal coating for a medical officer, a sword showing the sigil of Albert I, and a specific model for the then colony forces, showing two lions and the coat of arms of the Belgian Congo with its motto 'Travail et Progrès'. It is very interesting to note that this royal decree of January 31st 1845, and even that of September 25th 1855, describe the lion as being set within a garland of oak leaves, as in the First General model. 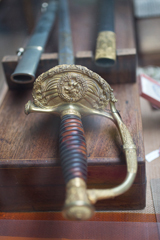 This, however, is contradicted by L.Leconte in the 4th "Carnet de la Fourragère" of July 1926, where he states that he believes that this description was kept in order to allow officers with said First Model to keep it, while all new swords were made with the new lion and sigil + oak and laurel crown. Although this is not in line with the more recent article of Claude Feys in "AMI magazine number 30", the argument put forward by Leconte are, I believe, conclusive. 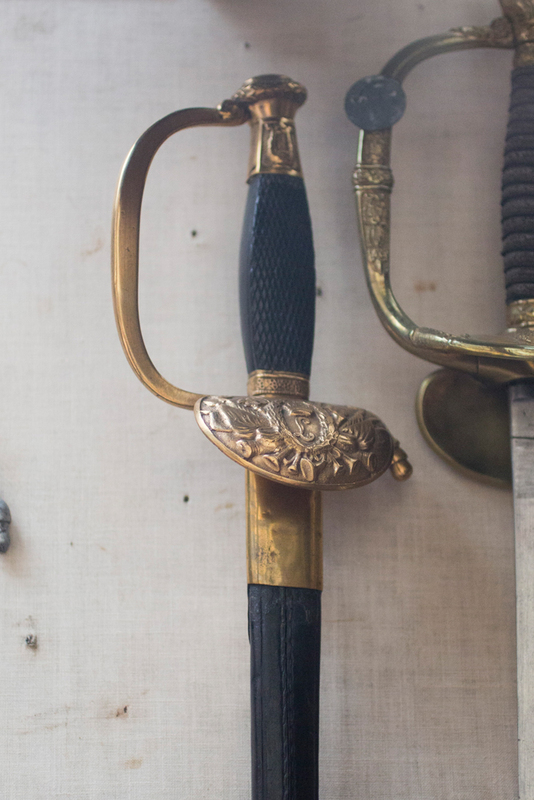 They include several example of said Second Model swords with blades inscribed 1846 and a portrait by Rysack of Lieutenant-Colonel N. Leconte, then captain of the 2nd lancers, sporting such a sword in 1849. This is also more coherent with Belgian gorget designs as described in L. Leconte's 'Le Hausse-Col belge' in the 2nd issue of the "Carnet de la Fourragère" of July 1925. 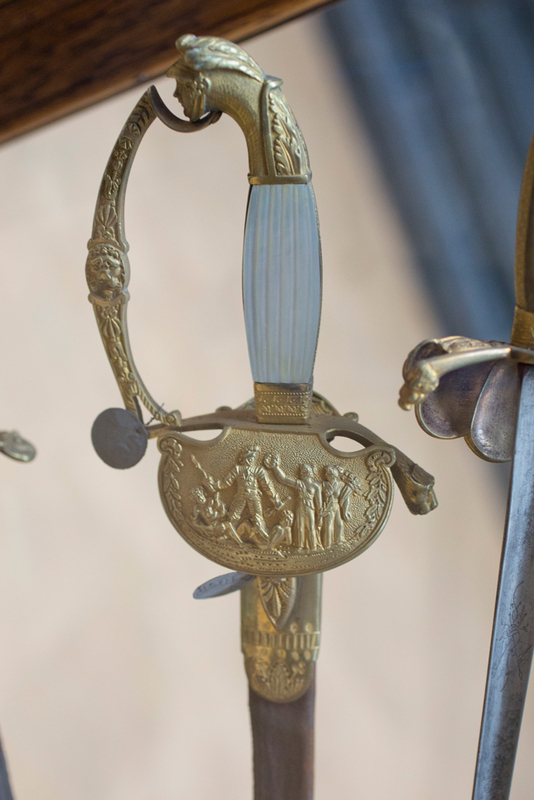 Both the 1830 and 1831 gorget models show a lion within a garland of oak leaves, the first model's lion holding a lance with a Phrygian cap on top. The 1845 model shows the lion and sigil, with oak and laurel leaves. 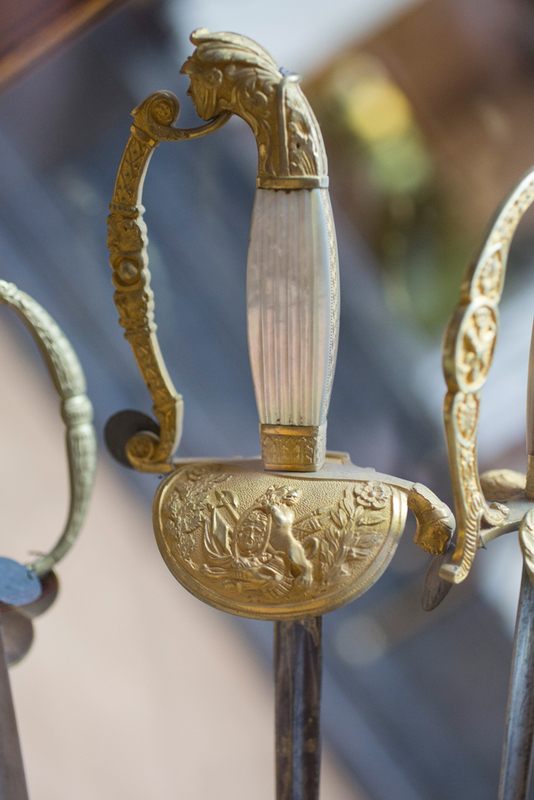 Changing the sword's shell attributes in 1845 would have insured uniformity with the gorget. 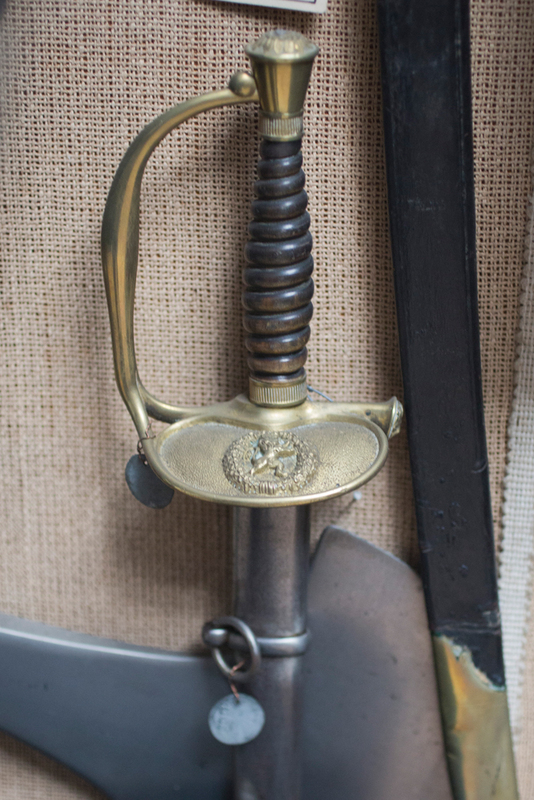 This sword was replaced by the saber then used in the infantry (the 1889 pattern officer sword) by the decree of September 19th 1911 and this for medical officers and fortifications personnel. I have yet to find a date of replacement for other units, but the decree of March 26th 1913, relative to the different army uniforms, mentions only the saber, never the sword. On December 31st 1891, a new sword was attributed to officers of the state's marine, marine construction engineers, and pilot under-inspectors. 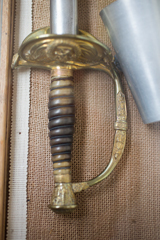 This sword had gilt hilt and fittings, a shell with fouled anchor and a blackened leather scabbard with two bands with loose ring. Leconte's book does not discuss civilian swords, so I have little information to offer, but I do know that the first two photos are that of a Belgian prefect's or mayor's sword, the last three photos are that of a Belgian Congo administrator's sword. 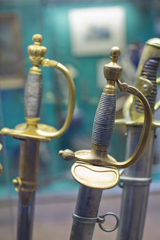 Other examples of these sword patterns can be found here, here and here. This model, which was already used under Dutch rule, was attributed to the musicians of infantry bands by the royal decree of July 1st 1831. It features a flat, straight blade which is engraved, blued and gilt. Some square-section blades can be found. The simple hilt, prolonged into a curved quillon, is in copper and the grip in ebony, showing a grid pattern on the larger sides. 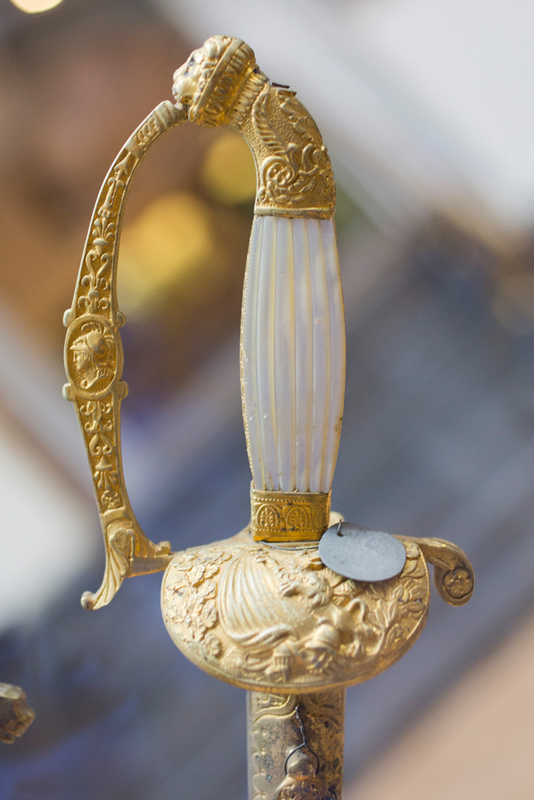 Shell decorated with musical instruments and olive shaped pommel. 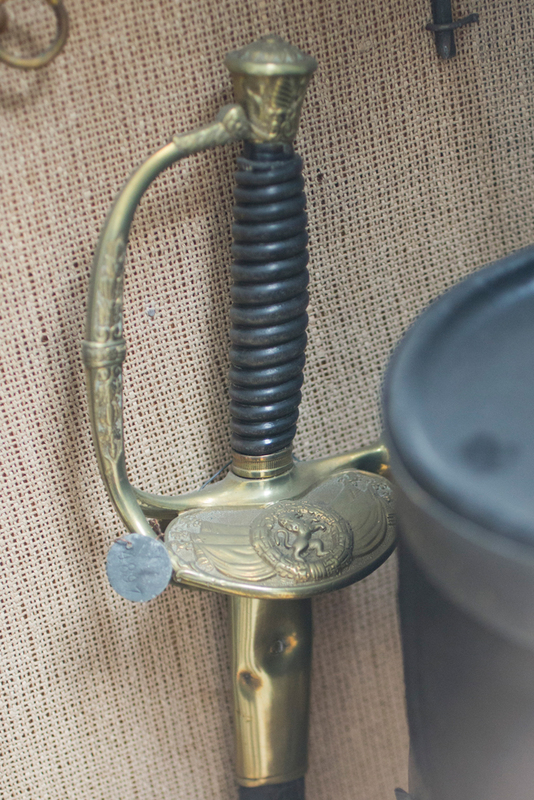 Blackened leather scabbard with copper locket fitted with a frog stud. 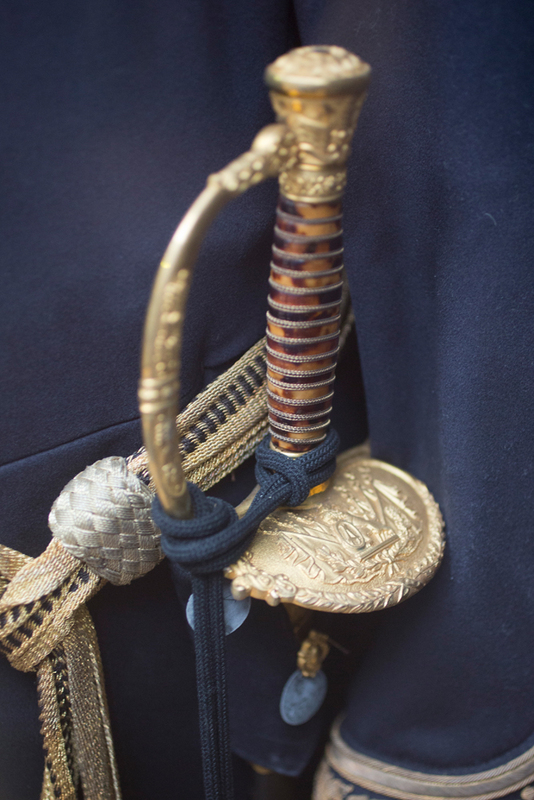 Total weight, scabbard included : about 1 kg. The second example shows a variation replacing part of the musical instruments with the king's sigil. 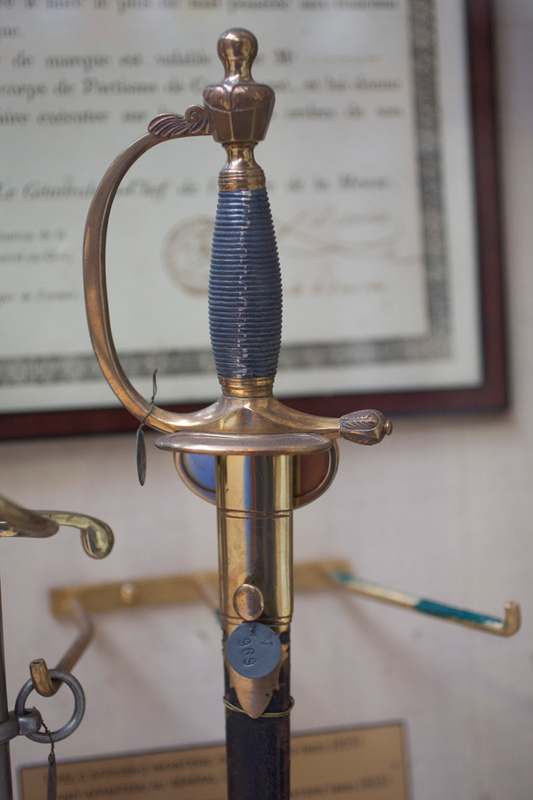 The royal decree of Jan 31st 1845 replaced the previous model by a Belgian one. It features a straight double-edged blade of diamond section, with flattened edges in the upper blade section. 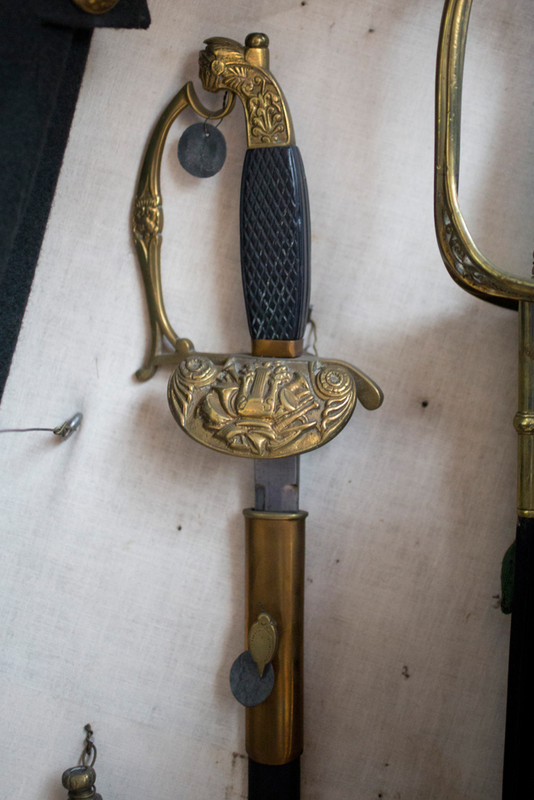 The tip of the blade is shaped as a carp's tongue. Blade length of 83 cm. 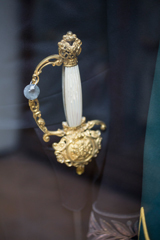 Guard in chiseled chrysocale, with a single branch prolongated into a single quillon. The branch is decorated at mid-height with a lion's head. Shell decorated with musical instruments on a grainy background. Chrysocale pommel in the form of a helmeted head (probably Minerve). Ebony grip, showing a grid pattern on the larger sides. Blackened leather scabbard with chrysocale locket fitted with a frog stud and cannelure. Beaded chape with cannelure. The decree of February 2nd 1911 replaced this sword by the 1893 pattern NCO Yatagan, but allowed the use of existing swords until they had to be replaced. 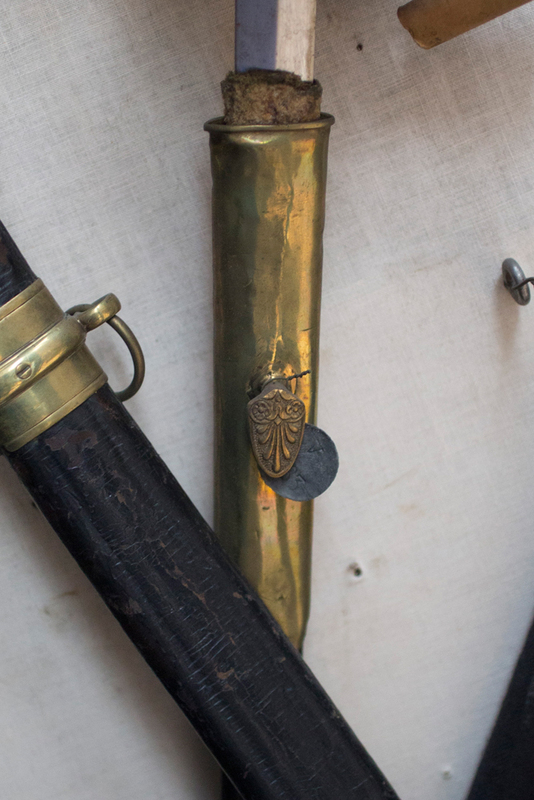 L. Leconte's "Les armes portatives des troupes belges, de 1830 à 1910"